Welcome to two new Board members, Mark Williams (CEO at East Devon District Council) and Iain Vosper (Director at South West Water). Massive thanks and good luck to Jonny Miller (Exec lead for our Green Infrastructure work) and Richard White (Exec lead for our Sustainable Seas work). Due to job changes both Jonny and Richard are having to step down as LNP leads. Their replacements are being agreed and will be announced in the next newsletter. The LNP's Naturally Healthy Group has been awarded £500,000 of National Lottery funding from Sport England. 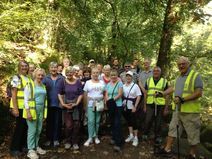 The 5 year Connecting Actively to Nature (CAN) programme aims to help over 3000 older people in Devon and Torbay to connect actively to nature. Massive thanks to Active Devon for leading this bid and all partners who are contributing. The Forestry Commission is working with mental health charity, Mind, to offer a series of activities at Haldon Forest Park over the autumn period - see 'Feel Good Autumn'. This initiative follows a Mind survey which revealed that 94% of respondents said green exercise benefited their mental health. Public Health England has launched a new Active 10 app as part of its ‘One You’ physical activity campaign encouraging people to walk briskly for 10 minutes. To find some great Devon walks see the Explore Devon website. The Integrated Care Exeter initiative explores better ways of supporting patients who visit their GP with socially based rather than medical problems. The project has been shortlisted for a prestigious National Health Service Journal award and also has been extended to April 2020 to cover all 16 GP practices. See the award shortlist. If you are involved in an Naturally Healthy projects that could be linked to this initiative please contact ella.huffman@exetercvs.org.uk. There is loads of work going on across the county which contributes to the Get Devon Buzzing initiative. To find out more please see our website. Build for Bees competition Winners! Congratulations to our first winner, Niquita Potter in East Budleigh, who has built this fantastic bug hotel for pollinators all by herself. 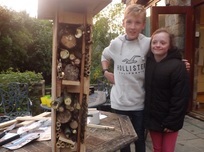 An amazing effort with lots of great features for solitary bees in her build. 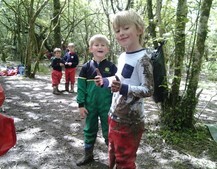 Well done to everyone from Bishops Nympton Primary School. As well as building a huge bug hotel for pollinators, they also made their own wildflower patches! 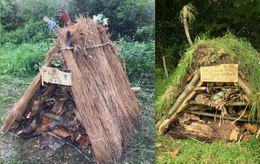 Congratulations to Friends of the Byes, a community nature group from Sidmouth, for putting these very creative builds together. Local thatchers donated some thatch bales to create the roof. Well done to two runners up; Ebon Seldon Green from Great Torrington and the Honiton beehive community gardeners. Many thanks to Goren farm, The Natural History Book Service, Stover Country Park, Devon Wildlife Trust, Buglife and the Bumblebee Conservation Trust for sponsoring the competition. South Devon AONB has teamed up with Cornwall AONB and the University of Exeter, as part of a new project which is working with farmers to help bees and business. The project is looking for guidance from farmers and agri-food businesses. For more info see here or contact G.Twiston-Davies@exeter.ac.uk. Congratulations to Hamis Bengough of Dennings Down Farm, Axminister. A family-run livestock farm including a County Wildlife Site, ancient semi-natural woodland, hedges, ponds and other habitats. This project has engaged over 1,000 people and visited almost 100 sites across Dartmoor, Exmoor and Bodmin moor. For information (including survey results) and to get involved see the website and contact Megan Lowe (mlowe@butterfly-conservation.org). A new national project is giving a boost to some of Devon’s rarest species including the Narrow headed ant (contact stephen.carroll@buglife.org.uk) and the Grey long-eared bat (contact cdunton@bats.org.uk). Projects on lesser butterfly orchids and arable plants are being developed. Work will include habitat management, events, community activities and volunteering opportunities. More info in the next newsletter! Outdoor Learning and Sustainability Conference 2018 – Book now! Unshaven hedges attract the birds! 1. Cutting slow-growing stretches of hedges only once every three years, providing a lifeline for wildlife on any farm. 2. Not trimming hard – leave a few inches of new growth. There’ll be more flowers and berries next year. FWAG SouthWest and the Devon Hedge Group have produced a document about management advice for hedgerow trees. This scheme offers grants of £35K to £1 million for up to 40% of the cost of capital investments required to improve forestry productivity. This round of CPS closes on 3rd April 2018. Contact Kate.Tobin@forestry.gsi.gov.uk. LEADER grants are also available across most of the South West and are offered by Local Action Groups to support projects outside the scope of CPS. Members of the LNP's Devon Invasive Species Initiative are producing fact sheets for some of our problematic invasive species. To see these and information on partner invasive species projects see www.naturaldevon.org.uk or contact Kate Hills (khills@southwestwater.co.uk) or Jeremy Peirce (jpp@jp-associates.co.uk). Dartmoor ‘Moor than meets the eye’ project is successfully working to control invasives species such as Himalayan Balsam and Skunk Cabbage starting at the top of the Dart and Bovey catchments. .
Natural England and partners have set up an exhibition at the National Marine Aquarium (NMA) in Plymouth to promote Marine Protected Areas. It includes interactive maps, videos and kids’ colouring activities. Launched in August 2017, this new initiative aims to clean up and protect the coastal habitats in Torbay. Work involves reducing marine litter pollution and its impacts. For more information or to get involved visit their Facebook page. Tim Youngs has been appointed as the new manager for Blackdown Hills Area of Outstanding Beauty. 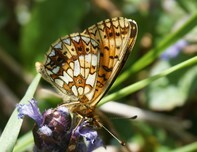 Tim previously worked with the Somerset Wildlife Trust where he was Director of Land Management. Read more about Tim's appointment.